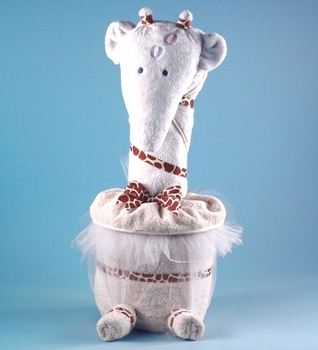 Giraffe's are among nature's most beautiful animals and our Gentle Giraffe design towel cake is no exception. Impress the new parents with this elegant beauty standing over 24 inches tall. Packed with things every baby will need and designed with neutral tones for either boys or girls. Beautifully gift-wrapped, this cute baby shower gift makes a fantastic centerpiece decoration and will also thrill the new parents when sent as a congratulations! Free shipping too.